Mensusa https://www.mensusa.com/articles/different-style-to-carry-the-three-piece-suit-graciously.html Different Style To Carry The Three Piece Suit Graciously The three piece suit is a gallant choice as the apparel for the formal and special events. The traditional and the aristocratic style of carrying these suits will enable you to appear stylish and fashionable to the public. Surviving the various stages of evolution and changing trends, which is a prime feature of the fashion domain, the three piece suit has retained its relevance as classic apparel for men. It is a fact that the suits are the apparels that will flash in the minds of the fashionable men in the instances they are required to get a special appearance. The 3-piece suits are truly a delightful choice of apparel for the formal events and promenade occasions. However, each of these ambiances being different from the other, you need to bring some changes in the style to carry the suits. The article will suggest you different approaches to carry the 3-piece suits that will make you appear classy and fashionable. The style is in practice for several generations. The traditional approach to carrying the three piece suit suggests that you will button the coat and you will pair the suit with a shirt in contrast color. It will be wise to opt for the 3-button jackets in this style. You have the liberty to opt for the single-breasted or the double-breasted 3-piece suits, as per the ambiance that you will attend. You can go for the peak lapel and the notched lapel suit for the usual business dressing while for the promenade events; you should pick the shawl lapel style. For the colors, you have to make the choice depending on the suitability of the color with your skin tone and the ambiance that you will attend. For the choice of the tie , it will be ideal to go for the ones that are designed in the diagonal patterns. This approach will be ideal for the corporate functions and the white-tie occasions. 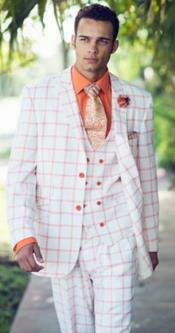 This is the most modern approach to wearing the three piece suit that goes perfectly for the promenade occasions. In this style, you will have to pick the jackets and the vests in deeper shades and it is to be paired with the lighter shades of shirts, usually the white. For the tie, you need to pick the ones that come in deeper shades. However, before picking the shade of the suit, do consider its suitability with your skin tone as well as the spirit of the occasion that you will attend and its ambiance. www.mensusa.com will offer you a delightful portfolio of 3-piece suits from the leading fashion brands. You will get these suits at the most reasonable prices. The store will also get you a delightful collection of fashion accessories. The store has secured a reputation for offering wonderful customer services, both at the pre-sales and the post-sales stages.